Greece has influenced the Western World in many ways. The Ancient Greeks especially contributed many things to the scientific world, from medicine to astronomy. 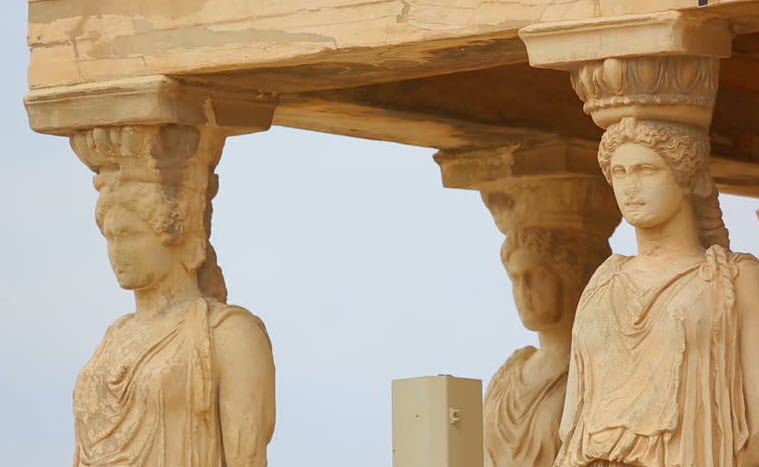 This web site will focus on the contributions of Ancient Greek scientists. Democracy in Ancient Greece is most frequently associated with Athens where a complex system allowed for broad political participation by the free male citizens of the city-state. Democracy, however, was found in other areas as well and after the conquests of Alexander the Great and the process of Hellenization, it became the norm for both the liberated cities in Asia Minor as well as new cities built in conjunction with Greek occupation. Democracy, although a functioning ideal, weakened with the Roman conquest of Greece which gave more power to local oligarchs than to average citizens. The goal of Athenian democracy was that all citizens should have equal political rights and the ability to fully participate in either the council or the Assembly. Participation, however, was limited to free males whose parents were also deemed citizens. This eliminated foreign residents - aliens, even if they had lived in the city-state for many years. Additionally, freed slaves were never considered citizens. The same model was used in cities established by Greek colonists or in the wake of Alexander’s conquests. Women seem to have the same status as men and you can read about the most famous women in history here. One historian, for example, estimates that the citizenry of Alexandria in Egypt was a very small percentage given that the indigenous Egyptian population was barred from citizenship. Although citizenship was determined by birth in the city-state, interchangeable citizenship treaties existed whereby citizens of one city-state could be considered citizens of another. The Ionia city-state of Miletus is cited as an example. While there were no property qualifications attached to citizenship initially, Roman expansion introduced this limitation in Greece and is usually attributed to Pompey in the late Republican period. The council’s function was to limit the Assembly’s power by proposing legislation and, in the later centuries, vetoing measures coming out of the Assembly. Historian A. H. M. Jones writes that, ideally, the council was designed to, “accurately reflect the general sentiments of the people.” Members of the council usually reflected the wealthier classes who saw political leadership as a civic obligation. The Assembly, at least in Athens, was composed of 500 members, chosen by lot from the various “tribes” or clans in Athens. Their chairman or designated leader was also chosen by lot and only served for the one designated meeting. In Athens, the Assembly met forty times a year. By 400 BCE, members of the Assembly received a minimal stipend to attend the sessions in order to encourage participation and defray lost income from time spent in the Assembly. The historical record indicates that the Ancient Greeks fully believed that men were qualified to participate in the political process, despite the misgivings of some thinkers such as Plato. The crafting of the U.S. Constitution, for example – though owing its greatest inspiration to English freedoms dating to Magna Carta, was heavily influenced by both Greek and Roman historical models. Historian Colin B. Goodykoontz (deceased) points out that the Founding Fathers were highly educated in the Classics and, dismissing Ben Franklin’s recommendation to spend time in prayer, looked instead to Greece and Rome for inspiration. Goodykoontz writes that, “…the references to ancient history by the advocates of constitutional change were intended to show that the early confederacies had often failed because of faulty organization; and that they had been in more danger from the insubordination of their own members than from the tyranny of rulers.” Royalty have always been a prominent topic, why don’t you take a reading from the famous royal women of history? Ancient forms of democracy, though limited in some respects, were predicated on the belief that citizens had the right and the intellectual ability to make sound decisions affecting their communities. Further, a detailed analysis of the complexities of these early forms of ancient government shows that there was an effort to hold accountable persons entrusted with the welfare of the state. This remarkable step in Western Civilization paved the way for notions of due process.